Home Lifestyle Bollywood Salman to be 1st guest on Kapil Sharma’s new show! 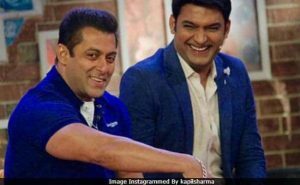 Salman to be 1st guest on Kapil Sharma’s new show! Mumbai (IANS): Comedian-actor-producer Kapil Sharma has started shooting for a new edition of “The Kapil Sharma Show” with Bollywood superstar Salman Khan as its first celebrity guest.